There’s no contesting the fact that this legendary Manufacture has been an influencer for a remarkably long time…part of the reason can be credited to their creation of one of the most distinguishable timepieces in the world. Since the Royal Oak’s debut in 1972, the iconic model has not only been regarded as a classic but has also persistently evolved and advanced. 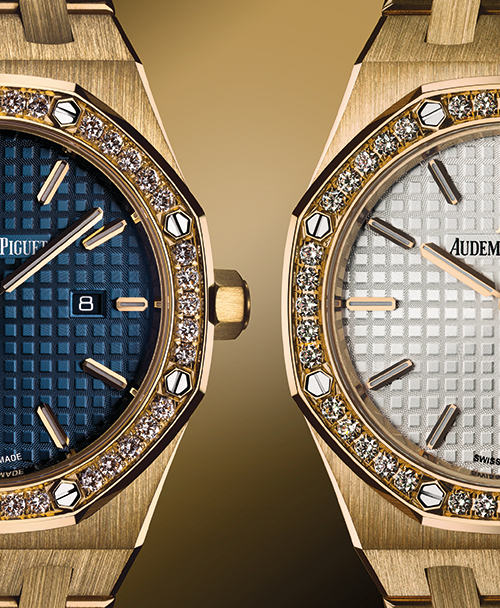 In 1976, four years after its conception, Audemars Piguet extended the collection to women of discerning taste. 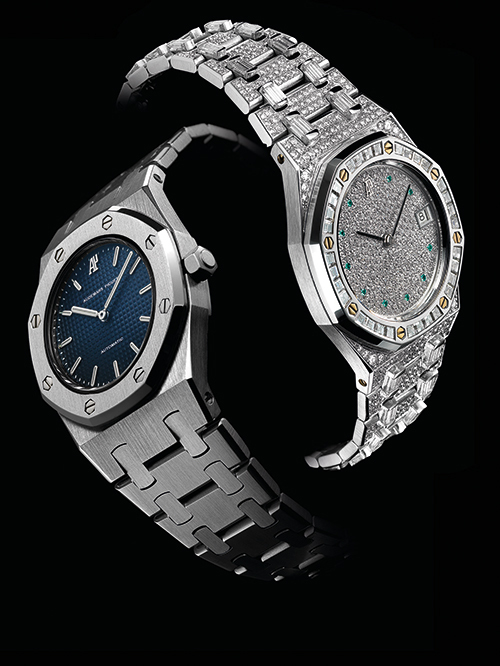 Originally christened Royal Oak II, the Royal Oak Dame was designed by Jacqueline Dimier. Smaller than the original, its blue tapisserie dial was set in a three-part steel case, enabling adjustments to be made without completely dismantling the movement. The year 1978 saw the introduction of the watch in gold, followed in the same year by a self-winding version with a grey tapisserie dial and yellow-gold bezel and links, and the stunning Royal Oak Open Worked in 1993. Offered in yellow gold, white gold, pink gold and platinum, the piece had a visible skeleton movement in addition to an elegant finish comprising lace-like carvings. It was in the 1990s that the brand began to pair the definitive design with exquisite jewellery techniques, and watch-loving ladies began to covet fully gem-set models. The Royal Oak Haute Joaillerie flaunted 784 brilliant-cut diamonds and 10 emeralds, and came just a year before the smallest Royal Oak ever made — the 1997 Royal Oak Mini. Around this time, a number of versions set with precious stones appeared in small numbers, uncatalogued and outside of any collection. 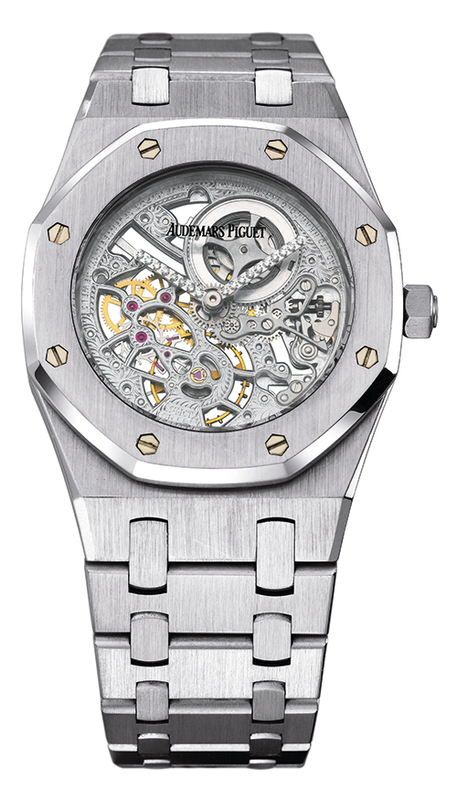 The Royal Oak Leaves series was crafted in 2005. Its stunning gem-set case was held by an embroidered satin bracelet. The mesmerising Royal Oak Tuxedo made an impact three years later, its diamond-set hands, bezel and case making it a statement accessory for the finest soirees. Audemars Piguet didn’t stop there. 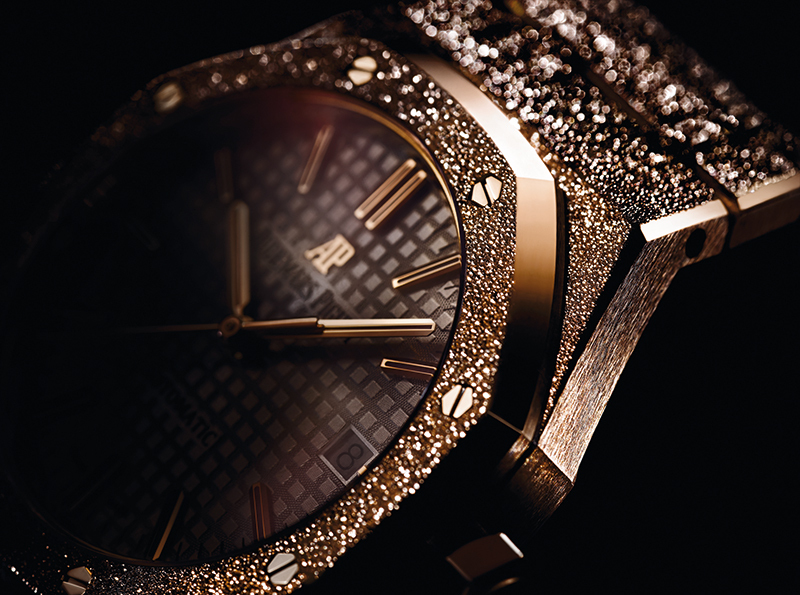 The level of craftsmanship employed to create the 2011 Royal Oak Diamond Paved timepiece made it seem like the watch had been actually carved out of a diamond. Master jewellers of Le Brassus selected the purest Top Wesselton diamonds, allowing them to be individually shaped into customised baguettes. The 517 stones were then meticulously prepared in order to achieve a paving that entirely covered the surface beneath, without even the tiniest glimmer of metal in sight. The Royal Oak Selfwinding and the Royal Oak Quartz in Yellow Gold — introduced in 2011 and 2016 respectively — were two other noteworthy additions to the collection, but the crown jewel has to be this year’s Royal Oak Frosted Gold. In celebration of the 40th anniversary of the women’s Royal Oak, the watch is created in collaboration with jewellery designer Carolina Bucci, who has redefined an ancient gold hammering technique, known as the Florentine technique. Beating the gold with a diamond-tipped tool creates tiny indentations on the surface, giving a sparkle effect similar to that of precious stones, like diamond dust. 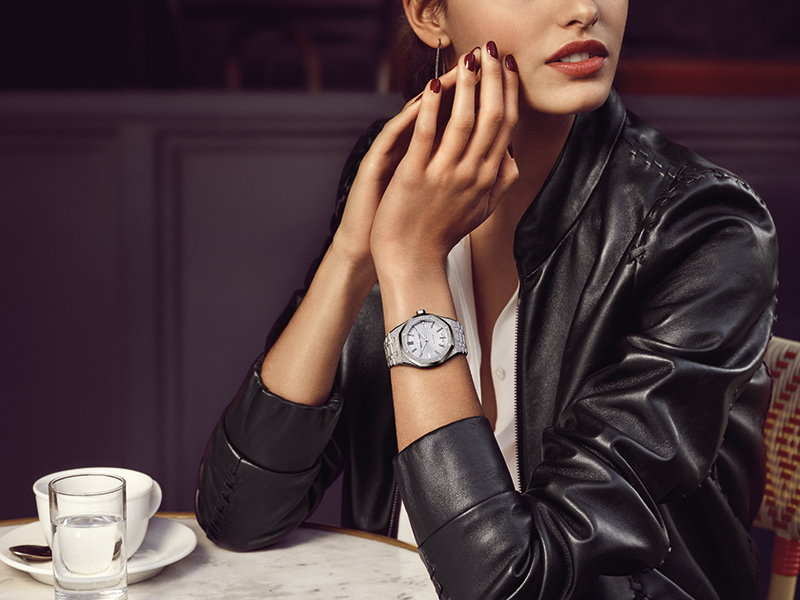 Trendsetting, innovative and ethereal, it honours the trajectory of the Royal Oak watches for women and is a testament to Audemars Piguet’s ongoing quest to combine artistic excellence and technical mastery.